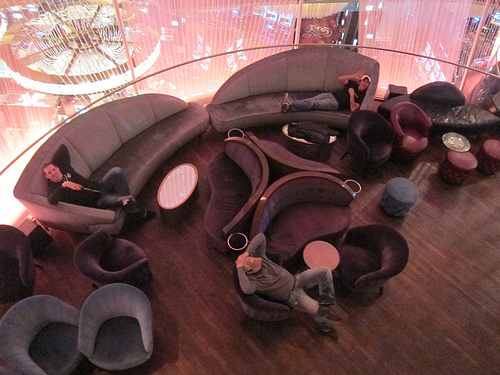 On my last night in Las Vegas, we went to check out what was going on at the Cosmopolitan Hotel. I’m in love with the Vesper but I figured it was good to see the other bars there. 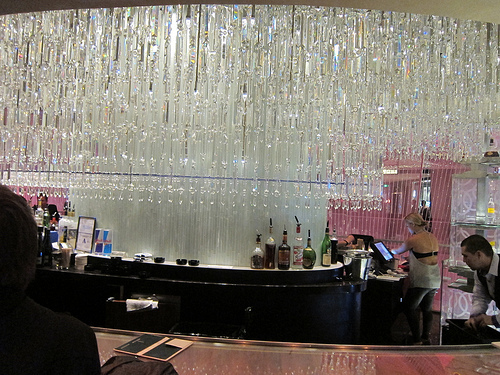 At the Chandelier, the massive 3-story bar that is the darling of the hotel shines with incandescent light made more brilliant by the thousands of crystals surrounding the bar. Since it was a Monday, it was a bit slower than usual so they had closed down the middle floor. Well, not to us. We had beer and Sambuca shots here. I’ll have to come back to try the cocktails from Chandelier’s Property Mixologist Mariena Mercer. I had her molecular Old Fashioned the evening before at the recent Repeal Day party. Do you know Flat Stanley? Well, the bottle of cinnamon is a private joke between this guy and that guy that’s similar. You’ll just have to ask them. When you hang with bartenders, you tend to not bother other bartenders on duty with trivial things like cocktails. We got a bottle of Meletti. 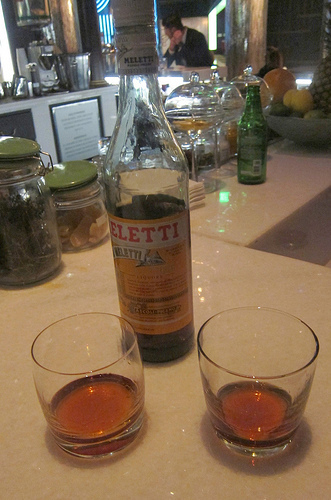 Funny, Vesper is the first place I ever had that amaro and of course I love it. 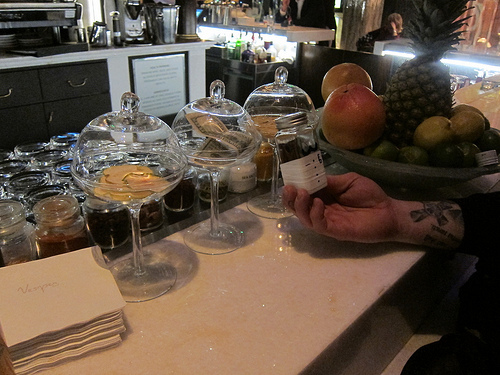 This entry was posted in bar stories, bars, bartenders, beer, hot bartenders, travel and tagged amaro, bar, bars, bartenders, beer, chandelier bar, cosmopolitan hotel, hot bartenders, las vegas, meletti, sambuca, the chandelier, the minty, the vesper bar, travel, vegas, vesper, vesper bar. Bookmark the permalink.